What Should Be The Balance Between Gym Time And Skill Work For Athletes? TOPIC: What should be the balance between gym time and skill work for athletes? There is no point in having the perfect athletic body if you have no skill. There is also no point in having all the skill and no athletic body. What should be the balance between gym time and skill work? Bonus Question: What do you enjoy more, gym time or skill work? Why? In preparation for any sport, a balance between time spent in the gym and time spent on skill work for the competition is important. The key question is; what is this proper balance exactly? I will try to help you understand that right now. First you must access a few factors about yourself and the sport you are in? After each question a brief sketch of its implications will be addressed. 1) Is The Sport Seasonal? Does It Have An In-Season and An Off-Season? If the sport is seasonal then you should shift focus to more skill work during the season and more gym time during the off-season. Also, as you draw closer to the season you should gradually shift time away from the gym to skill work. Remember you should always be doing both but the ratio at which you do them is important. 2) Do You Have The Athletic Base Required For The Competition? For certain sports that include a greater degree of time and skill like football, soccer, and basketball your skills will do you no good if you&apos;re not in the physical condition to complete a whole game. Here, additional gym time may be needed on the treadmill or on the track to improve your endurance. Also strength training is a must so that you are not physically pushed around by your competitors. In this situation you may benefit more from training more, rather than developing your skills. 3) Do You Feel That Conditioning and Strength Wise You Are Already Equal Or Superior To Your Athletic Peers? If this is your case then it should be obvious that you need to shift more focus toward skill work. You should not reduce gym time to the point where you start losing progress, but a maintenance program will be sufficient. For example, how many power lifters would be good at football? Not very many unless they had the necessary skills and techniques needed to play the sport effectively. 4) Are There Certain Weight Conditions For Your Sport? This is especially important in sports such as boxing, wrestling and gymnastics. In these sports weight plays a crucial role in performance. Think about doing any of these three sports with extra weight. You will probably fatigue much quicker in the event and may be able to utilize less of your skills because of that condition. In sports such as these, extra attention needs to be paid toward gym time because of these weight factors. 5) Does The Sport Require More Focus On Skill Or Raw Power? As most athletes know certain sports definitely require more raw power than skill. Even within certain sports certain positions require more strength and conditioning than skill. Take for instance tennis and offensive lineman in football. In tennis the ability to score points with precise shots is important. Yes, strength and conditioning due to gym time is important but a player who can win with many aces and good shots does not need to be as conditioned. A lineman on the other hand requires technique but many athletes, especially at the collegiate level who show superior power to their opponent may be able to excel because their physical strength and endurance is far superior to their opponent. In this case, more time should be spent toward strength and conditioning as opposed to skill work. 6) What Ability Level Are You In The Sport You Play? During this phase more attention should be placed on learning good skill habits and techniques as opposed to building strength which can be done at any time later down the road. It is much more difficult to unlearn bad habits than to develop strength and conditioning in an individual. During this phase the foundation techniques have been learned and more time should be shifted toward conditioning. Since the athlete now has an effective skill base the athlete can afford to shift more time to the gym to become at least as physically gifted as their competitors or at least come as close as they genetically can. Experts are now at least as physically conditioned as their peers. Now they can take this added size, strength and endurance and utilize new techniques and skills they could not do before due to certain physical limits of the body. Think about a football players transition from high school, to college and finally to the NFL. 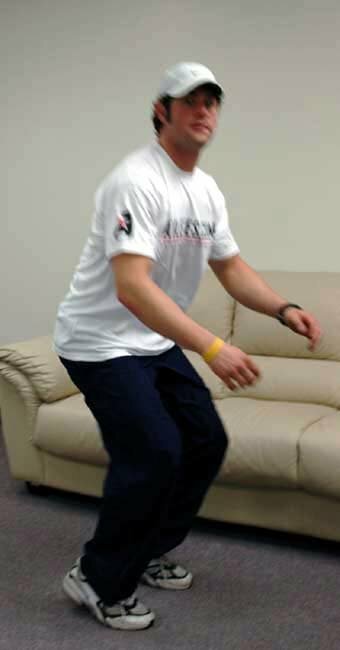 Most successful players develop good playing habits in high school, then in college they are physically developed (even though they are still learning new techniques), and finally in the NFL where most players are equal physically, more advanced techniques are needed for success. The key question everyone wants to know - Which is more important? If you really read and understood what was discussed earlier then the answer should become clear. Both are equally important but the emphasis of either depends on the current situation of the athlete. If the coach sees that the athlete will develop better due to physical training and gym time then that&apos;s what should be done, but if technique is not up to speed then focus should be placed more on that. Time considerations are also important when deciding which is more important. You don&apos;t want to go into a season without first getting out some rust during the off-season. You need to practice technique work especially leading into the new season. As you can see what is more important is actually specific for that particular person and cannot be generalized to everyone. Which Is More Important In Sports Training: Gym Time Or Skill Work? What Do I Enjoy More? Me personally; I definitely enjoy time in the gym more than time spent refining my technique. With gym training it is more readily apparent the gains you make. If you become faster you can measure it. If you are stronger you can measure it. With technique training the results are not as evident. For me, this is why I think I like gym time better. I can track my progress and see my results a lot quicker than with technique training and skill work. Dieting, training, skill work, school and a social life can take a toll on any athlete. How often do you find yourself wondering if you are getting enough time in the weight room, are you shooting enough 3-pointers (or throwing baseball, football, etc, whatever your sport requires). There are only 24 hours in a day. With school and everything else, where can we find a balance in the weight room and doing skill work? Obviously this will vary. Most people will only need one hour in the weight room a day. During this time they should be able to lift successfully. Remember when it comes to the weight room, more is not always better. However some people may require more work doing skill specific work. These people are usually lacking in the skills needed to perform in their sport. For the average athlete though 2 hours a day of skill specific drills will increase their performance. I suggest athletes follow a 2:1 ration of skill work:weight room work. This will allow athletes to develop both strength and a good level of skills. What Should An Athlete Do During This Time? "It is not always how much time you put in, it is how much effort you put into this time." Athlete A - "Athlete A" spends 4 hours a day shooting basketball after school. "Athlete A" walks around shooting for his 4 hours going half speed and just breaking a sweat. Athlete B - "Athlete B" spends 2 hours a day shooting basketball after school. "Athlete B" moves quick and at game speed. He makes game moves and goes full speed. Afterward he is soaked in sweat. Now "Athlete A" spent 4 hours and "Athlete B" only spent 2, who is working harder and getting better results? Obviously it is "Athlete B." Remember it is not always how long you put in it is how hard you work during that time. It is more important to set a standard of time that you can go in and put your max effort in, then go at half effort for a longer amount of time. Remember this when you decide how long to do you skill work. This is why I suggest no more then 2 hours at a time. Two hours is a good time for skill work because it allows you to put in your max effort. After two hours you will be greatly fatigued causing you to lose effort. This means it is time to stop. Two hours also is good on your body nutritional wise. After two hours of increased physical activity your body will need a break. The body will also need to replace its carbohydrate source and protein burned during activities. This will prevent muscle breakdown from your body going too long without carbs and protein. One hour in the weight room is plenty. This is common knowledge. Studies show that at around one hour your body&apos;s ability to build muscle drastically drops. By exposing your body to long periods of weights you also increase the risk of injury. This is vital; you don&apos;t want to be rushed in the weight room, but you also do not want to be in there more than one hour. So you need a routine that combines all the aspects into a compact routine that you can easily complete in one hour. I suggest Westside 2, also known as WS4SB. It is a 4-day routine designed for athletes who do both skill and weight training. It is designed to increase strength and performance on the field as well as in the weight room. Click Here For A Printable Log For Monday. Click Here For A Printable Log For Tuesday. Click Here For A Printable Log For Thursday. Click Here For A Printable Log For Friday. This should allow you to complete your workout in an hour. Keep all rest times to 45 seconds except for max effort lifts (bench and squat); they will be one and a half minute. How Should I Spend My Skill Time? You should spend your 2 hours of skill time focusing on half speed and acceleration and the other half skill specific drills. For the speed and acceleration I will outline a basic routine. I will also give help with sports specific drills. Everyone knows speed kills; that is why it is vital to every athlete. Speed can make or break a play. Focusing on speed should take up around 45 minutes to 1 hour of your skill work. Plyometrics should not be overlooked, they are vital in increasing overall power output and explosiveness. I personally like simple plyometrics routines. Click Here For A Printable Log Of Plyometrics Routine. Warm-up - Self explanatory, make sure you perform them to get your blood flowing and loosened up. Transition Sprints - Sprint the first 20 yards then turn around and backpedal the last 20. Focus on keeping your balance while turning around, you should be able to get your footwork down to where you don&apos;t have to slow down when turning. Lunges - Hands behind your head, step out as far as possible, go down slowly then back up. Make sure to go slow on these. Frog Leaps - Go down like a squat then explode back up off two feet, focus on really stretching out and jumping far, but don&apos;t sacrifice form. Make sure to concentrate on going hard on all your sprint work. Sprint work is vital to becoming a faster athlete. In this routine we will focus on both longer and shorter sprints. The longer sprints will increase your anaerobic threshold, so you can maintain your short speed and power throughout the course of your sprints. Shorter sprints will prepare you for the actual 40 test and help more in the speed department. Click Here For A Printable Log Of Sprint Routine. 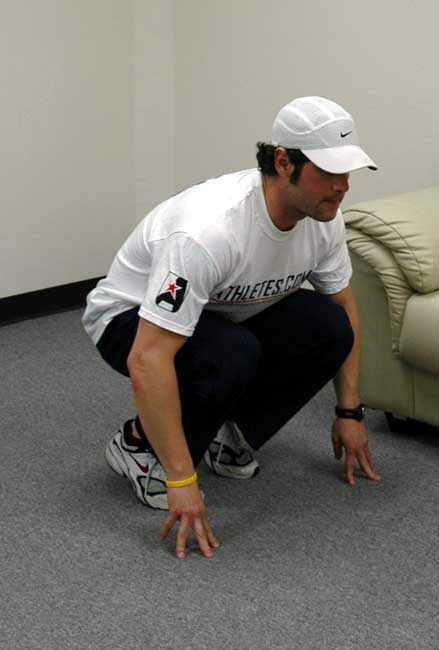 **On Reverse sprints you will back pedal for 30yds and sprint back to the starting point. Speed is possibly one of the most vital stats to an athlete. Not only does an individual&apos;s speed tell how fast someone is, it also shows their explosiveness and acceleration. Many colleges look at a person&apos;s 40 time to see not only how fast a person is, but how fast they can get up to speed. For instance, an extremely fast athlete could have a slow 40 time if it takes them 20 yards to get up to full speed. Whereas another athlete could be slower than the first but have a better 40 time simply because they can accelerate quicker. This is why, when we train for a sport we must include both speed and acceleration training. Studies show that most muscle gain happens in the first 45 minutes to an hour, and diminishes quickly after an hour. More than two hours of skill specific drills at a time causes fatigue and increases risk for injury. After two hours your body will be depleted of nutrients and in need of a meal. If you go hard, at game speed, and put in max effort, more than two hours of drills should not be needed. An hour in the weight room and two hours in the weight room should be ample time to get in your needed workout and speed drills. Remember, it is not always how much time you put in; it is how much effort you put into that time. I personally enjoy lifting weights more. I like the rush I get when I pump iron. I find myself more motivated to workout because it not only helps me in my sport; it changes my body and makes me healthier. Skill work is not as fun to me, however nothing beats game day.